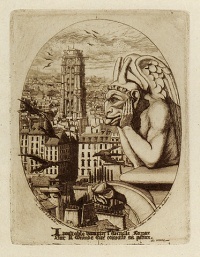 Stryge (1853) is a print by French etcher Charles Méryon depicting one of the chimera of the Galerie des chimères of the Notre Dame de Paris cathedral. The principal church of a bishop's diocese which contains an episcopal throne. Unless indicated otherwise, the text in this article is either based on Wikipedia article "Cathedral" or another language Wikipedia page thereof used under the terms of the GNU Free Documentation License; or on original research by Jahsonic and friends. See Art and Popular Culture's copyright notice. This page was last modified 06:10, 3 July 2014.